● Lightweight steel plate brace is integrated in the breathable composite cloth wrap to provide superior support for stiff fingers. The rigid steel plate brace prevents tendons from catching and the joint from bending to promote healing and reduce pain and discomfort. ● Constructed with a lightweight breathable composite cloth, the trigger finger splint will not slide or bunch. The breathable material wicks away moisture for comfort day and night. How to deal with trigger finger with ZJchao finger splint naturally? ● The combination of moist heat, trigger finger splint, massage and exercise is both safe and relatively simple natural solutions for trigger finger or trigger thumb non surgical. 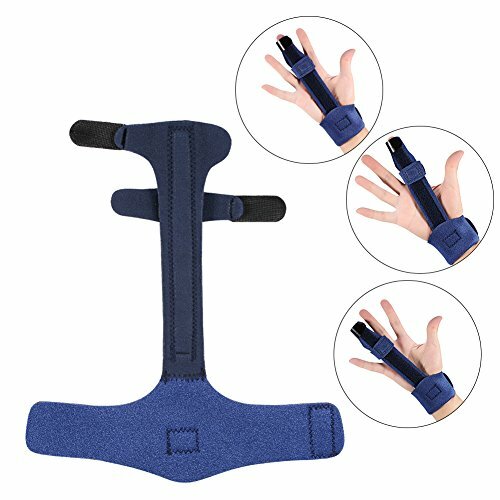 ● ZJchao trigger finger splint features the elastic ring and one extra detachable Hook & Loop tape, fitting all the fingers or thumb. Hand wash in cool water, with mild soap and air dried- We don't suggest machine wash.
We are so confident in the quality of our trigger finger splint, which if for any reason you are not satisfied with your item, we will give you a full refund within 60 days warranty!